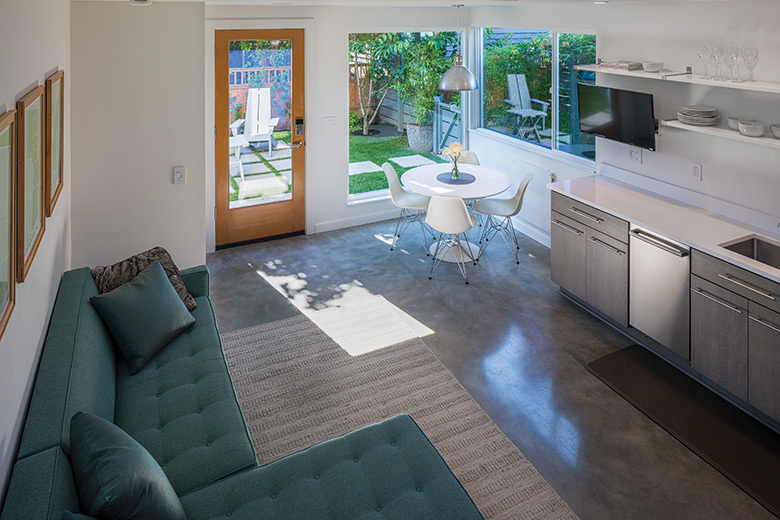 Concrete floors line the kitchen/living area in this 620-square-foot detatched accessory dwelling unit (DADU) that looks out onto its own private yard. Like many urban dwellers in this red-hot real estate city, Jenifer Merkel and Chris Charles wanted to get as much mileage out of their property as possible for their growing family. They saw an opportunity in the old garage that abutted the alley behind their Green Lake house. Building a detached accessory dwelling unit (DADU), aka mother-in-law cottage, was an ideal solution. DADUs function as a jack-of-all-trades dwelling, utilized as everything from a rental unit to a home for extended family. Merkel and Charles envisioned all that—and more: The couple needed a place to live with their two toddlers while they did a major rebuild of their main house; they planned to host visitors and family events there, as well as rent out the space; and finally, they hope to live there, and rent out their main house, after their kids are grown. They called on Seattle-based architect Victoria Carter to create their cabin-in-the-city dream—small cabins being a large part of her design repertoire. However, building a DADU on their site posed some particular challenges. Most of the cabins Carter has designed are secondary homes sitting on spacious lots, rather than urban homes with city-imposed height and square footage limitations and power line setbacks. Nevertheless, Carter dove in. Photograph by Ed Sozinho. The exterior of the DADU is clad in durable cedar siding and topped with a metal roof. For the DADU, Merkel and Charles prioritized natural light and privacy, two sometimes conflicting elements. Windows needed to be creatively placed and sized to maintain privacy from both the alley and the primary house. The front of the dwelling is oriented to its own small yard, not facing the main home, and a big single-pane window, along with a glass-paned door, brings the majority of light into the lower floor, according to Carter. On the side of the dwelling that faces the main home, there’s another large window that looks out through an airy screen of bamboo, planted in a galvanized box and set strategically outside. At the rear of the home is a 6-foot-square, south-facing window—placed high in the stairwell to maintain privacy—which brings in a huge amount of southerly light that filters brightly down to the main floor. Meanwhile, the side of the house along the alley, where just inside is the living space with sofa against a wall, keeps a sense of separation. “You have no sense of being [near an alley] at all when you’re in the building,” says the architect. She notes a large upstairs window that introduces light, as well as offers a serene view of the yard and tree tops. “The cabin lets you know where you are, but it doesn’t announce it,” remarks Carter. Photograph by Ed Sozinho. To save space, structural elements of the staircase were left exposed. Inside, the couple wanted two distinct spaces, a common sleeping space and great room “where we would cook, eat, play and lounge,” says Merkel. For the great room, Carter says, it was important to keep everything, from appliances to cabinets, scaled to fit the space and simple—not a lot of ornate detail—to keep visual clutter at bay. Photograph by Ed Sozinho. The stairs lead to a bright upstairs bedroom with a treetop view. The stairwell’s woodwork is one of Charles’ favorite elements, and it connects the new home to the site’s history. “We salvaged the studs from our 100-year-old garage and utilized that wood for the stair screen. I feel like a part of our old house continues being useful. The fir for the stair treads was salvaged by a friend from a tear-down on Queen Anne. I like that we get to see the wood every day,” he says.